Interview at La Linea Bella ! - Meet Titus the Teckel! WHAT'S YOUR MOTTO? "ALWAYS THINK BIG!" - I think that should be everyone's motto. After all, we dachshunds are only tiny on the outside. WHAT ARE YOU, HOW DID YOU GET HERE? 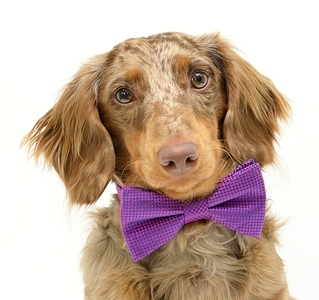 I am a dapple Dachshund from Louisiana, born on June 23rd, 2012. I came via plane to live in Virginia in August of 2012 and I am at La Linea Bella ! with my Mom every day to help and protect her. And boy, she stays busy! I'm loving every minute of it, and I've gotten really good at protecting the shop with my impressive vocals. As of late, I also have to protect my little sister PANDORA. She arrived in July 2014. Likes: I love to meet new people (although I like to thoroughly check them out first). They always seem to take my picture. I've snuck on Mommy's computer and together with local photographer Kay Taylor I've have set up my own Facebook page and a very cool BLOG featuring my adventures like my recent appearance on a local billboard, my PROJECT BO-TITUS, cool local visits and more shenanigans. WHAT'S NEW? There is a lot happening in my life I tell ya. And I have the most awesome group of enthusiastic friends. The best new thing? My sister Pandora. ANY LAST MINUTE WORDS YOU'D LIKE TO SHARE WITH OUR READERS? I hope I'll get to meet you soon -- and come and visit me any time! I love hugs and treats (especially CHEESE! ), but most of all I love it when you go "Oooo!" and "Aaah!". That happens a lot because I'm so darn cute. From time to time I host benefits for local animal charities, so stay in touch AND COME AND SEE ME! 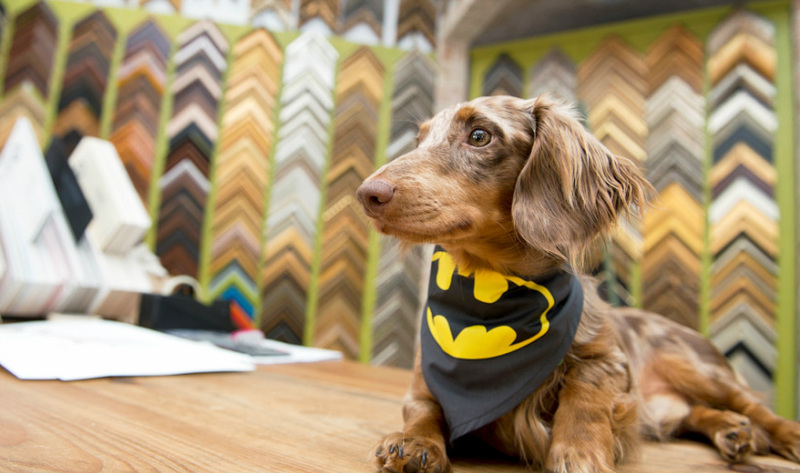 My studio is set up in the gallery and that's where we take all our pictures, and pictures of other dogs too. So CIAO for now and see you on Facebook in the mean time! THANK YOU, MR. TECKEL. WE'LL BE SURE TO CHECK OUT YOUR LINKS AT THE BOTTOM OF THIS PAGE PRONTO! NICE TALKING TO YA! Pandora is also a mini (black-and-tan/dapple) dachshund. She arrived on July 19th, 2014. She will be assisting Titus in his daily chores and will definitely amuse you while you pick out your framing. Chief Style Consultant at La Linea Bella!